Boo! Halloween is just around the corner and Graveyard Pudding Halloween Treats are perfect for last minute people! I can make these in 15 minutes flat. Don’t worry. The appearance and taste aren’t compromised. Halloween parties offer the perfect opportunity to get creative in the kitchen. Halloween party foods range from the spooky and creepy to the fun and unique. 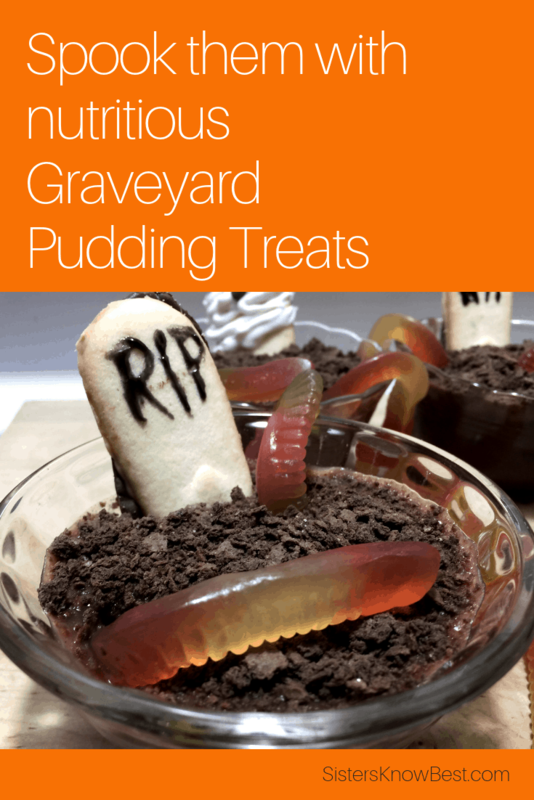 Graveyard pudding is more on the fun and unique end of the spectrum, which means it’s also ideal for a kids’ Halloween party. 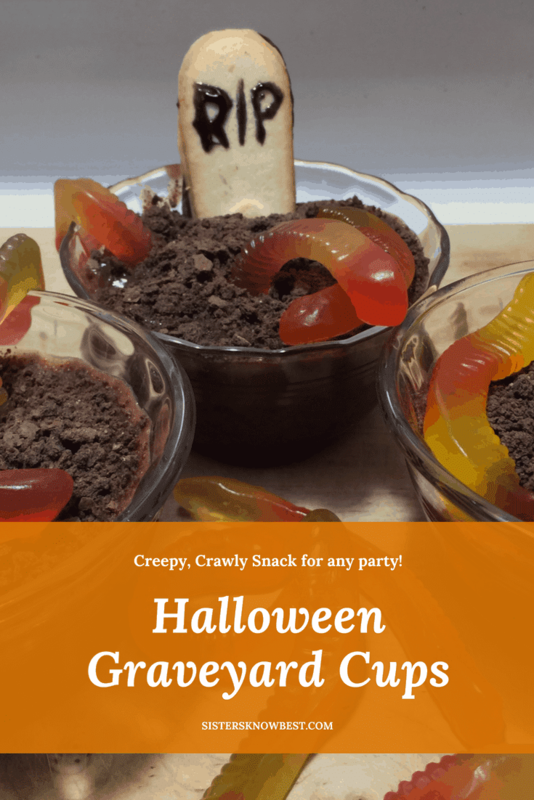 The original Graveyard Pudding recipe used different ingredients than we did, but ours are just as yummy and just as fun to make. Write RIP on the Milano cookies with the black gel frosting and set aside. I cut the top of my gel container too wide. Easy fix. I used a toothpick for better control. Now mix up the box of pudding as directed and pour into 4 small glass dishes. You can use plastic cups if you’re making these for very young children or for a large crowd. Also, the original recipe mixed a tub of cool whip with the pudding. This would make many more treats. Place graham crackers in a ziplock bag and crush thoroughly. Next, cover the top of the pudding cups with the crushed graham crackers. Insert the empty end of the Milano cookie into the edge of the pudding cup so the RIP shows. Lastly, place gummy worms in the cup. 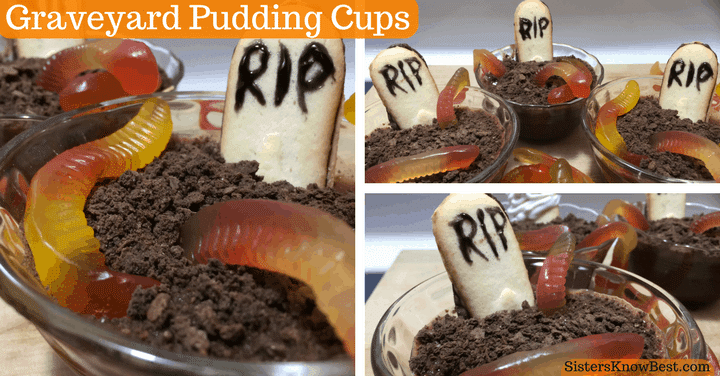 Graveyard pudding cups are fun to make, fun to eat, and make the perfect sweet treat for any Halloween party. What treats for Halloween are you making this year? 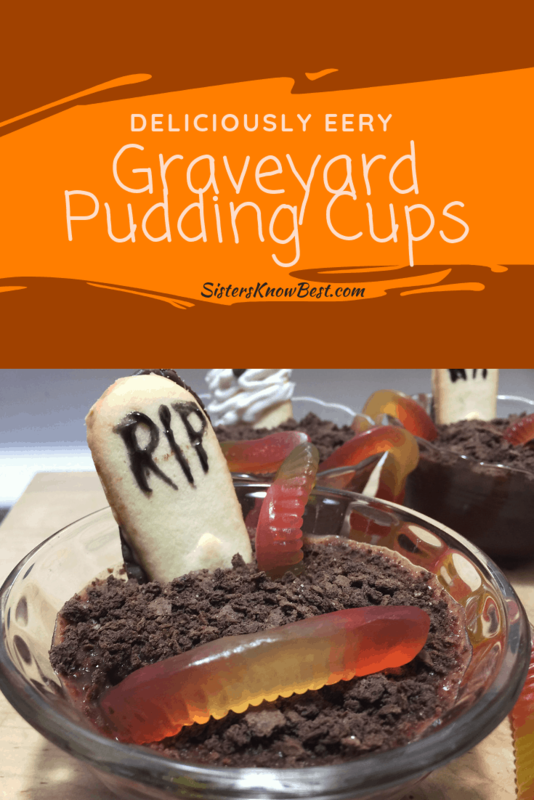 If you tried the graveyard pudding cups, how did your party goers like them?